As it often happens between AMD and NVIDIA, a product released by one competitor forces the other to review market positioning of its existing solutions and roll out new models in return. Since it's imppossible to create a new GPU every time, manufacturers usually cut down the features of existing processors and release reduced versions as new products. This also lets them sell GPUs with defective execution units unable to work at required clock rates. This has been going on for a long time. And today, AMD releases an answer to NVIDIA's GeForce GTX 550 Ti and closes the performance gap between the low-end Radeon HD 5770 and mid-end Radeon HD 6850. The new Radeon HD 6790 is based on the cut-down Barts GPU used in the Radeon HD 6850 lineup and is supposed to cost about $150. Just to remind you, Barts doesn't differ much from Cypress. One of the reasons is that the 32-nm process technology has been cancelled and the 28-nm one is yet to become available. In these circumstances, AMD decided to modify the existing architecture instead of creating a new one. Barts is optimized for lower power consumption and cost price, but there are some technical improvements as well: more efficient geometry processing, new fullscreen antialiasing modes and improved anisottropic filtering. As you can see, the HD 5800 and HD 5700 series were replaced by HD 6900, HD 6800 and HD 6700, and HD 5700 descended even lower. And the gap is closed by the new Radeon HD 6790. As a result, AMD's graphics card family still features different architectures (HD 6900 introduced certain architectural changes too). Now let's take a look at the specifications. Unified architecture with an array of stream processors for handling vertices, pixels, etc. The use of Barts in such a solution has been made possible by further improving the 40-nm process technology. Unfortunately, the novelty cannot boast of great power efficiency, because its maximum consumption is even higher than that of Radeon HD 6850. This has probably been done to increase GPU voltage along with clock rate and also make use of most chips that previously would've been considered defective. AMD Radeon HD 6790 will have to compete with NVIDIA GeForce GTX 550 Ti of which there are lots with various memory capacities and factory overclocking. It will also compete with GeForce GTX 460 which have been around for quite some time and become much cheaper. The naming policy hasn't changed since previous solutions. Strangely enough, the third digit changed to 9 instead of the expected 7. This should probably point at a minor performance difference between Radeon HD 6850 and Radeon HD 6790. The new graphics card has 1GB of GDDR5 memory. Today, this is optimal even for low-end solutions. Interestingly enough, although the memory bus remained 256-bit, the number of ROPs was halved (from 32 to 16). We've already seen this in previous cut-down cards from AMD. Despite the novelty belongs to the low-end price range, it has a dual-slot cooler covered by an AMD's traditional cover. This won't prevent other manufacturers from making custom coolers, of course. As you already know, Barts further develops the concepts introduced in previous generations of GPUs, so the differences from Cypress are mostly (but not entirely) quantitative. Like NVIDIA's latest GPUs, Barts mostly offers improved performance per watt and square millimeter, i.e. better efficiency. But it's hardly a new processor. It just has more execution units and a different balance between performance and consumption. Minor optimizations result in faster geometry processing, but that doesn't help much, and NVIDIA's solutions remain better in terms of tessellation. What's more interesting, the novelty's features the UVD3 engine that supports decoding of DivX and Blu-ray 3D (among other formats) and offers improved AMD Eyefinity and support for DisplayPort 1.2. Let's see what changed in the GPU compared with Radeon HD 6870 and HD 6850. 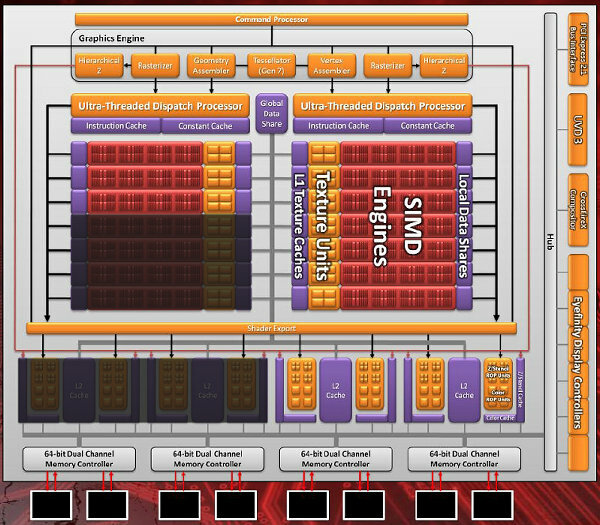 Essentially, AMD just disabled some of the 14 SIMD units and a half of ROPs. This naturally reduced the number of stream processors of which there are now 800 vs. the 1120 of a full-fledged Barts. The rest remains the same, even the 256-bit bus. Thanks to rather high clock rates and the not-very-cut-down GPU, the performance of Radeon HD 6790 should be close to that of HD 6850 and higher than that of GeForce GTX 550 Ti. This is what AMD got in proprietary performance tests. 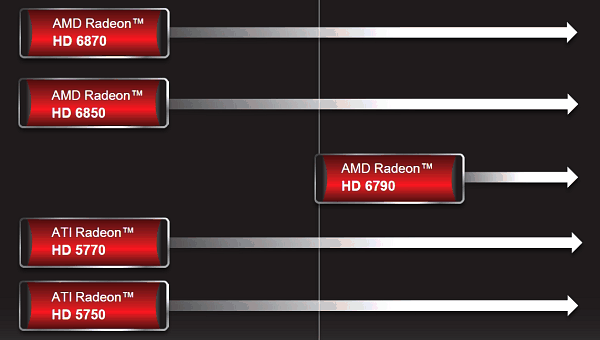 According to this image, Radeon HD 6790 is faster than the rival, the difference sometimes being 30% and more. Of course, we shall see if this is true in our own tests, but it seems that AMD Radeon HD 6790, along with NVIDIA GeForce GTX 550 Ti, is the bottom threshold you should consider when buying a gaming graphics card. It still provides acceptable performance while offering features like DirectX 11, AMD Eyefinity, AMD HD3D and such.